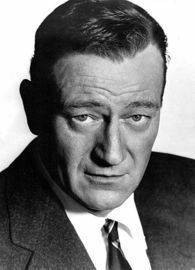 Marion Mitchell Morrison (born Marion Robert Morrison), better known by his stage name John Wayne, was a film actor, director, and producer. An Academy Award-winner, Wayne was among the top box office draws for three decades. An enduring American icon, he epitomized rugged masculinity and is famous for his demeanor, including his distinctive calm voice, walk, and height. John Wayne personified for millions the nation's frontier heritage. Eighty-three of his movies were Westerns, and in them he played cowboys, cavalrymen, and unconquerable loners extracted from the Republic's central creation myth."